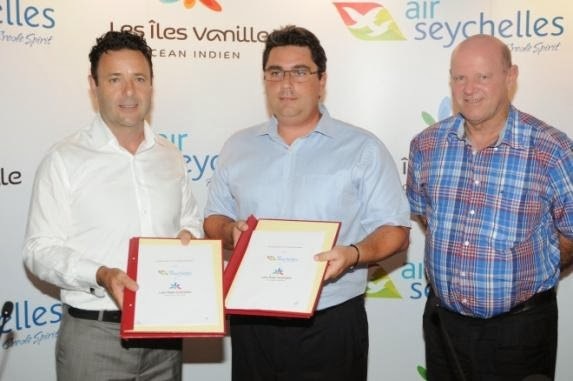 Air Seychelles, has signed an agreement with the Vanilla Islands Organisation to increase visitor numbers to the Indian Ocean. Under the strategic marketing agreement, the signatories will invest in a range of cooperative programs and products to attract visitors to the Indian Ocean from Africa, Asia, Europe, and the Middle East. Air Seychelles and the Vanilla Island's marketing messages will be maximised in the partnership and both organisations will benefit from enhanced presence on each other's marketing materials. Signing the Memorandum of Understanding (MOU) at the airline's new Fixed Base Operation (FBO), Air Seychelles VIP, at Seychelles International Airport were Cramer Ball, Chief Executive Officer of Air Seychelles, and Pascal Viroleau, Chief Executive Officer of the Vanilla Islands Organisation. The Vanilla Islands concept, created in August 2010 under the aegis of the Indian Ocean Commission, aims to unify the islands of Comoros, Mauritius, Madagascar, La Reunion, Seychelles, Maldives and Mayotte, under one tourism brand while retaining each of the island's unique selling propositions.